Reception: Friday, May 12, 6:00-9:00 p.m.
Gallery Hours: Thursday–Sunday, Noon–5:00 p.m. 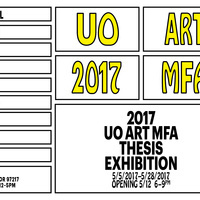 The University of Oregon 2017 UO Art MFA Thesis Exhibition presents the culminating work of eight master of fine arts graduate students. The University of Oregon Department of Art’s interdisciplinary graduate program encourages students to work across disciplines, with focus in areas of sculpture, photography, painting, drawing, printmaking, digital arts, ceramics, fibers, and jewelry and metalsmithing. The MFA program is a three-year course of study that involves rigorous studio investigation, critical discourse, and conceptual development. Emphasis is placed on developing a curriculum tailored to the needs of the individual student while encouraging exploration and risk-taking. For more information, please contact UO Department of Art at 541-346-3610, or Director of Graduate Studies, Assistant Professor, Christopher Michlig at artgraddir@uoregon.edu.